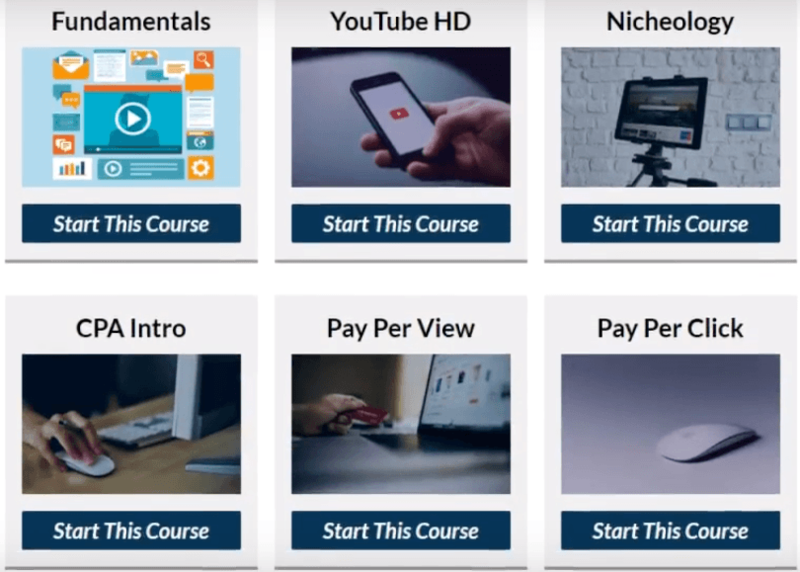 Welcome to my Easy Earn Commissions review 2019! Easy Earn Commissions claims that you can earn a $100,000 in your first year of working online with this automated system that does all the selling for you. This made me excited, and I decided to see the system and thinking that from the last five years I couldn’t find such a system that made me such income in a year. Then I decided to look into the system, and after spending my hours seeing videos and other information, this review is the most honest opinion based on that information. Whether it is really that easy for Easy Earn Commissions to fulfill its promises? Is it worth your time? And most importantly, is Easy Earn Commissions a scam or legit? 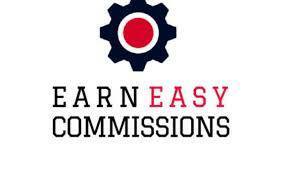 Summary: Earn Easy Commissions (EEC) is a program that called itself a "Done for You" solution to make money online. However, when you look at the program, the whole system is focusing around promoting the system itself. You get few done for you email swipes and other few things, but the most important part is traffic, which you need to bring it yourself. Though you get some of the free methods, their main focus is on paid methods. Overall, there are false claims and unethical practices which makes this not worth the cost. What is Easy Earn Commissions? The product didn’t get as popular as Easy Earn Commissions is getting. This may be due to better marketing efforts from Chuck, or maybe it was free when it gets started. 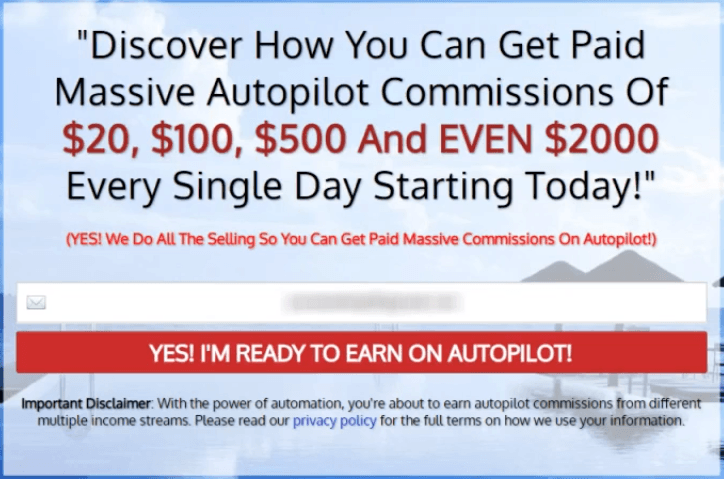 Basically, it's promoted as the automatic, Done-For-You System for you to earn commissions on complete AUTOPILOT! They also claim that it is a complete beginner’s friendly system that can make them their first $100,000 online. 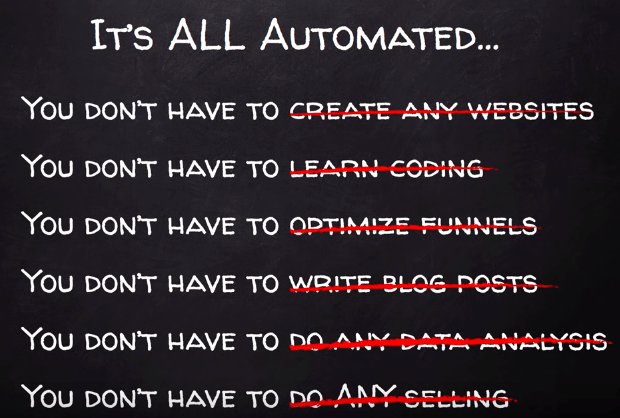 You don’t have to do anything as the system is completely autopilot and it does all the work and selling for you. Most importantly, the system is totally free. I know you get excited after reading this. Even I was also! I thought traffic as the lifeblood of every business, and if there is no traffic, you cannot make money. Even most people struggle to get traffic to their business. So, when Earn Easy Commissions is providing all the automated system for free so how they can bring in traffic for us. As usual, I don’t just see the program only from its claims. So, keep reading I have a lot of useful stuff about this program…. You can join it as a free member, but they recommend you to become an active member. (I have shown below how you can become active). You need to buy a separate domain name and hosting for this, where you upload this opt-in page. You could also use there as well. 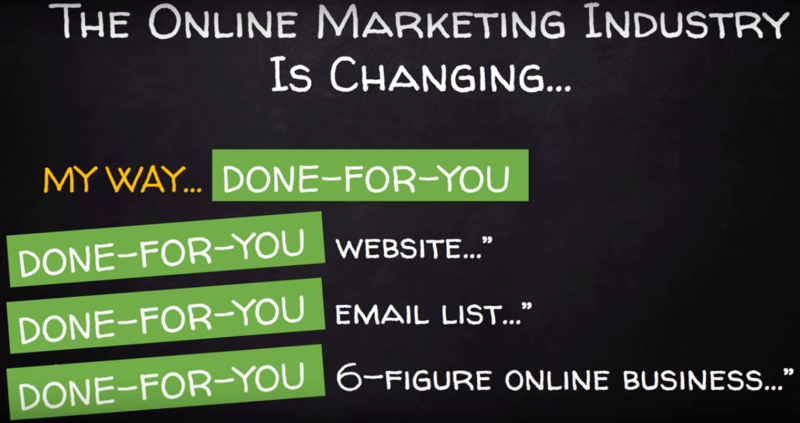 The next step is to drive traffic to your opt-in page. Chuck guides you a few methods like Facebook, Forums and Solo Ads to drive traffic. So, when people land on your opt-in page which is connected to the Get Response, if they provide their email ids then their email addresses will be captured by the autoresponder (Get Response). After this, the system itself sends them a series of emails and follows them up to join Earn Easy Commissions. So, they have this entire funnel set up to promote the system itself. So, if that person joins it and upgrades to Active, Pro or VIP membership: you will earn commissions. The higher level you are in, the better commission you will earn. I come to one conclusion; the system is perfectly designed for him to make as much money as possible. If you don’t believe me, I will show you later. The very first step is to join as a free member by providing your email id and some other basic information. They will then send you an email confirmation to confirm your account. You will see an introductory video from Chuck where he shows how his system works and it is a good platform than others. You are asked to join their Facebook Mastermind group where is a secret group he has created for this project. In this section, Chuck motivates you about taking action. Apart from mentioning quotes from a genius like Tony Robbins, Henry Ford, and Napoleon Hills; Chuck focuses on putting your effort and implementation of the system to get results. If you complete all of the above steps, you become an active member. In this step, you are prompted to become a pro member by paying $200. This will give you better rates of earning commissions and access to a few advanced training stuff. There are three membership levels in the EEC. Let’s look at each one in detail. You can create an account and join it as a free member. All you need is to take your affiliate link and promote it to other people. When someone joins under you, you will have a chance to earn money. It means that a person has to purchase a Click Magic Membership plan as well as Get Response Membership. Click Magic offers its basic plan for $17 and Get Response offers the starter package for $15. So, that person needs to invest $32 at the start to make you money. You may be thinking about how much money it can earn to you? So, if you are a free member and want to earn $10,000, you need to bring in 5,000 people who complete all those above steps. 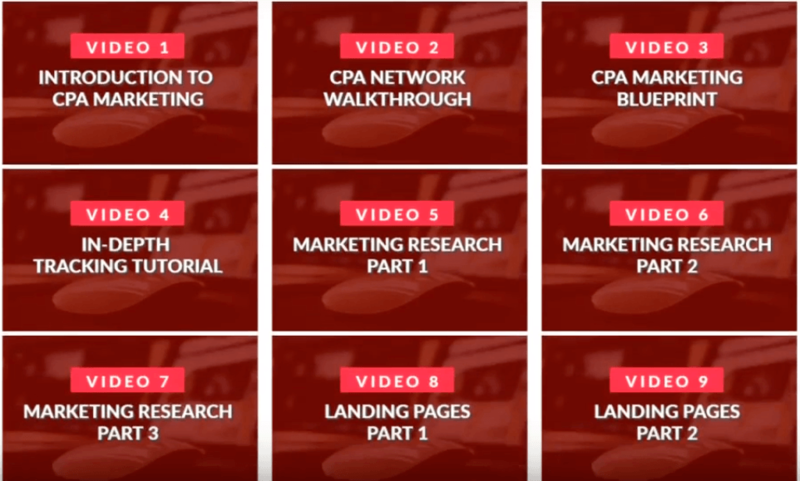 With a free membership, you can access their training portal which includes training on how to bring in traffic to your funnel. It means that a person has to invest $32 on Click Magic and Get Response. Get Response also offers a free trial account, but you couldn’t be achieved the active status unless you buy the paid account. PRO member is an advance membership option because here you need to invest money to get this option. You either have to pay a onetime $200 or five payments of $50 to access this. Done for You Email Swipes – These are tested email swipes which Chuck has used in the past and get results. Partner Up with Chuck – I will come to this section below. Your Extra Income Streams – This section will provide you with detail about how to get more benefits with PRP membership. I have already covered this above. As you can see these are all basic stuff with a lot of junk material and some of the courses have don’t have any relevance with the system. There are two VIP Packages you can choose from. In addition to the benefits given to the PRO members, VIP members can also earn based on the package they select. As stated above, there is no free to start this business opportunity. If you don’t have money to invest but know the secrets of bringing in other people, there is a chance you can make some money by referring them. If they become an active member, you can earn $2 per member. That’s how you could also become an active member and get open up more earning options for you. But if you are just a newbie and don’t know how does this all work, it’s really hard for you to make money. Chuck is the real person behind this system, and he is someone who is already involved in this industry for many years. If you look at my other systems, their owners didn’t show their face at all just to hide them. He is also running a YouTube channel with his friend/business partner, Andy. So, all this sounds like more trust and creditability. The system is working for many people, and they are earning commissions. I have seen few members on the Facebook group and YouTube videos to verify their claims. Though people are earning money, most of their earning proofs of small amounts like $10, $20, $50 or $100. The payout threshold for this system is just $10 which means you can withdraw your PayPal commission once you reach $10. This is a comparatively low payout threshold when you look at some other programs which have thresholds up to $50 or $100. That will be very hard to reach. Even as a free member you are encouraged to join their Facebook mastermind group. It is a good way to stay motivated as you are in between the like-minded people. Also, these people are sharing their success stories and different strategies which make you motivated. You can get any help in the form of asking questions in the community. I found it a very active group. I know watching some of the images above and their sales video, you have thought about too much hype especially you will reach $100,000 in your first year without doing any work. The program has more a lifetime of more than one year, but I couldn’t find a single person who has achieved $100,000 in the first year. Chuck has shown many income proofs on the site itself taken directly from the members, but they are all proofs of $3, $10, $20 or at most $100. It means there making such claims is just to lure simple, innocent people to join them and make money for himself. 2. All Done For You! Where is Traffic? Now let’s move to the part I have left above about traffic issue. 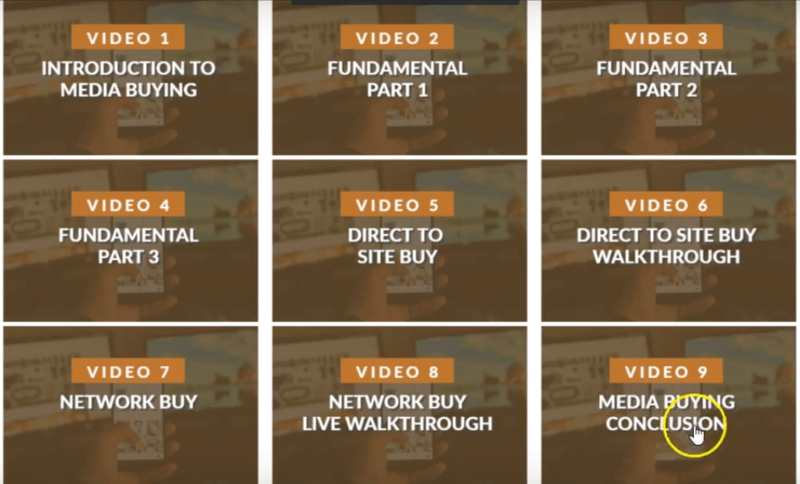 As claim in the sale video, you don’t need to do anything at all; the system will do all the work for you. But when I look at the member’s area, I saw training on traffic generation methods. So, what did they do for you? Then only done or set up a funnel which is promoting EEC itself. Even all the emails are designed for the system. Traffic is the lifeblood of every business, and this task is left for you. Now what! You are bringing in traffic for which Chuck will earn money. To recognize your efforts, Chuck will share the little money with you. I am not against Affiliate Marketing, and I am also doing it myself. But how Chuck is doing all this, I won't be pleased. Because if you don’t go VIP, despite the active and PRO members, you refer into the system you will not make affiliate commission for Get Response and Click Magic. 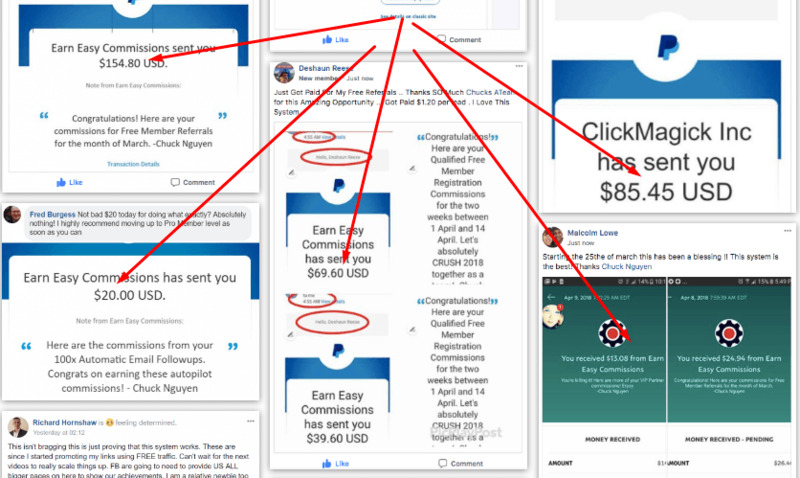 Any person you refer has to signup these two platforms by paying $32 to become active and in a true way it is your right to earn affiliate commissions from people who become active. But Chuck will enjoy your commission unless you become VIP. Please remember this is a recurring fee and as long as you affiliates are paying these, your commissions are going to be in the hands of Chuck. So, the focus is to prompt you to become a VIP member. You know what VIP membership fee comes at a price of $2,200. Earn Easy Commissions doesn't offer a refund to any of its membership. As it a non-tangible good and you can easily get access to them or even download them so due to the nature of these products, there is no way for you to return them. Well, this may look sensible to you but not to me. Because ClickBank (CB) is one of the world’s largest digital online marketplace and each product in CB covers a 60 days money back guarantee. If CB can offer this, why EEC can't? My guessing for not offering a refund is that Chuck does't have rust on their system, and also it's tough to manage them because the money will already be paid to the Chuck himself and sponsors. Basically, you are providing some things that plug and play. You don’t know the gist or essence of those things. If somehow, Chuck decided to shut his business down, so you left nothing. Even you don’t have the skills to start the other one. Again you have to start from the very first step. You are risking too much here, and your total dependency on this system could be disastrous for you. Even you can see that his previous system (Digital Elites Academy) is not running anymore and he has added this system in PRO membership. Not only this, but they have also changed their terms and conditions over the time. Previously, you can earn $1 for referring a free member, but it is no longer anymore. I hope you understand what I am talking about. Don’t put all of your eggs in one basket and the best thing is first to learn all the basics and then go for turnkey systems. 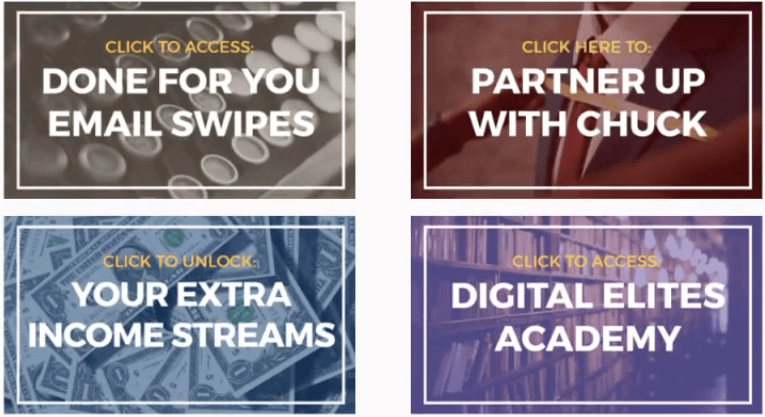 For learning all those skills, I recommend Wealthy Affiliate. This platform guides you all the necessary skills, knowledge and tools you need to build your own profitable online business from home. 6. Hidden Costs - NOT 100% FREE! I hope you already have got the feeling that this isn’t a free option. Even there is a lot of costs involved to take a start to Earn Easy Commissions. It would be fair if Chuck gave an honest analysis of cost that would be required to start earning good income each month. What Chuck said at the start that it is a completely free system for you to make money online, is totally BS! Don’t forget the cost of paid traffic though you can start with $200 as per my experience you need at least $1,000 to start so that there is enough data for you to proceed. Also, there is no guarantee that you will get results as most of the focus is on Solo Ads traffic. In solo ads you are basically renting out other people’s email list. Remember you and have no relationship with them and that’s why solo ads traffic is called cold traffic. Cold traffic is very difficult to convert. You first need to warm them up by building a relationship and providing them value. This certainly takes time, experience and more money. So, even you have not earned any money at all but spend thousands of dollars just to get started. That’s ridiculous! I have taken this from Wikipedia, which means pyramid scheme is a business model that recruits members on a promise of payments for enrolling others into the scheme, rather than providing products or services. Haven’t you got these feelings to Earn Easy Commissions? Let me tell you how - If you look at carefully, Earn Easy Commissions doesn't have any product. Their focus first on join you various third party services. The training is also not high quality and even it is also directed into recruiting new people into this system as well. If you see people, they are only joining them just because to promote them. They don’t have any focus on what is offering in training. This issue is also with companies like Digital Altitude and MOBE which is shut down by FTC recently. In simple words, the system is too good to be true. So I recommend you to stay away from this system — all you are here to waste your time and money. Even you may earn few bucks at the start, but you are moved to buy high tickets membership options and reinvest in the system and stuck your money. Their VIP membership cost you a hefty sum of $2,200. You can still sign up for their Free account to find out yourself since it's free anyway. I am also making money from affiliate marketing, but I am not totally dependent on one system. I have learned all those skills in Wealthy Affiliate. 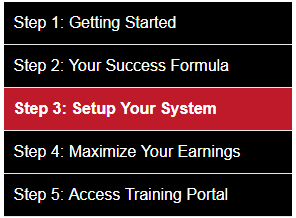 Now I am earning 4-figure income using this system. I can promote whatever thing I like. So, it reduces my dependency on one system. Also, you will find top-notch training here along with tools you need to run your business. 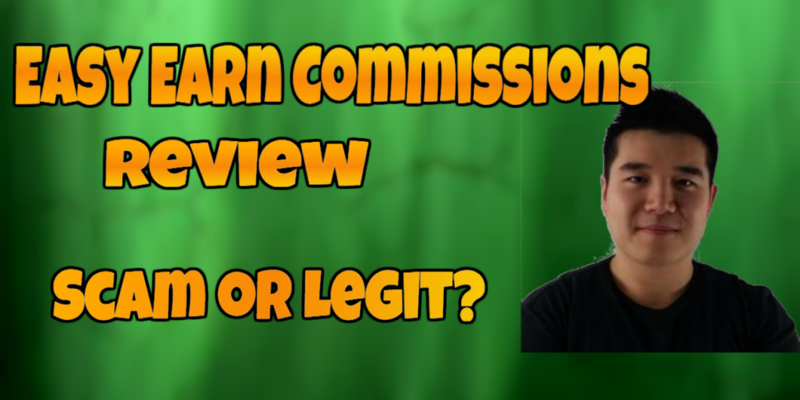 What's your thoughts on my Earn Easy Commissions review 2019 and if there is any question in your mind, please ask me in the comment section.